Seven reasons to love cold-blooded pets, too! My dad always had iguanas as I grew up, so some of my childhood memories are of those awesome green creatures crawling up his wall-papered apartment walls and attending Cold-Blooded conventions where I got to pet Burmese pythons and hold DuMeril’s boas. I wasn't afriad of our first grade class' Rosy boa and I had two fire-bellied toads at home named Yzerman and Federov. When I started dating my partner, Funk, I was elated to learn he had six — six!!!! — snakes, and I earned awesome points for wanting to hold them. We've since downsized to three snakes and added three bearded dragons. We are, officially, a reptile family. And it's rad. There's a lot to love about our cold-blooded pets, starting at the beginning. 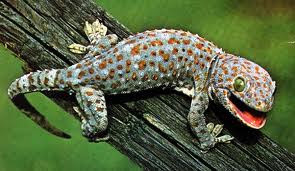 After initial set up, reptiles are low-maintenance. Sure, they need heat lamps and the right environment in their cages or tanks, but once all that’s set up, reptiles get fed every two weeks and need watering once in awhile. Other than that, the critters need to be handled occasionally — or all the time! — and sometimes need a little help shedding. It's a nice benefit that reptile tanks become instant décor — or even furniture! We have a gorgeous box tank that Funk’s grandpa built and Funk has turned an old bookshelf into a snake cage. The pieces look beautiful in our living room and the pets’ habitats have become part of our home décor. Just like any other pet, our herps teach our kid responsibility. He’s definitely going to be helping out with the bearded dragons. We bought them when we were pregnant and have called them our son's dragons since before he was born. As soon as he’s able, he’ll be helping clean their cages and feeding them meal worms. Plus, how rad will that be to have his friends who come over might not have seen a reptile before? Reptiles get a bad rap with the whole cold-blooded thing, but reptiles can cuddle, too! Have you ever had a snake wrap around your arms or curl up in your lap and just rest in the warmth of your body? It’s not a death grip; the snake is smart and knows it can’t eat you. Bearded dragons, meanwhile, love chilling on your shoulder or chest. You’re sharing your body heat with a cold-blooded creature. It's important to note there are different options for feeding. I know many people freak about feeding the snakes live mice, but there are options. If you don’t mind the mice but aren’t cool with feeding them live, frozen pinkies are available for your snakes! Also, there are water-dwelling snakes which eat fish, if that's easier for you. And don’t forget about the other reptiles out there — most turtles and tortoises are vegetarians, bearded dragons eat meal worms and crickets, and iguanas eat everything from lettuce to corn. While I'm definitely against the exploitation of exotic animals, they are pretty awesome as moving, living art. 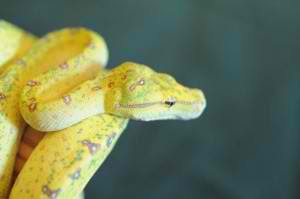 Our green tree python looks like a mix between a dragon and the snake, Kaa, from The Jungle Book. She is gorgeous. It's my hope that the more people that own snakes and other herps, the more education gets spread about them. They aren't "bad" animals. Snakes do bite. They strike when they’re hungry and they think food is in front of them. Sometimes the heat signal from a hand reaching in their cage, especially when they’re hungry, can be mistaken for a warm mouse squirming around. But dogs bite, too; cats scratch; birds nip. All animals come with “what if” situations. Because of cultural mythology and a lot of hype, reptiles get a bad name. Like with any animal, it’s all about safe handling and good pet ownership practice. Our herp kids have become part of the family and overall experience of our home. And no, none of our snakes are going to eat our son. Rachael is a Master's student and alternative mama who loves her apartment-living on a college campus, tries to read everyday, and is constantly trying to figure out how to make a rental more Robot family friendly.